Be involved with Colorado's oldest club interested in geology, paleontology, minerals and earth sciences. Must be a member to attend field trips and workshops with experts. Will be included in the members' only list to receive current news about world class programs and field trips. Low membership dues allows families and friends to spend time together. Get to know and network with other rockhounds, geologist, paleontologist and make new friends. Help with identifying your favorite rock, mineral or fossil. Membership allows entrance to the New Hope Amethyst Claim on scheduled field trips. Annual dues (Jan. 1 - Dec. 31) are due on January 1, after that date unpaid members are in arrears and cannot attend classes or field trip until currently paid for the year. You must be a member 30 days prior to attending a field trip. Members with unpaid dues after January 31, will be dropped from the roster. Any new member joining on/after October 1 will receive membership for the remaining current year and the next calendar year. Membership Application form and Release of Liability form are shown below. 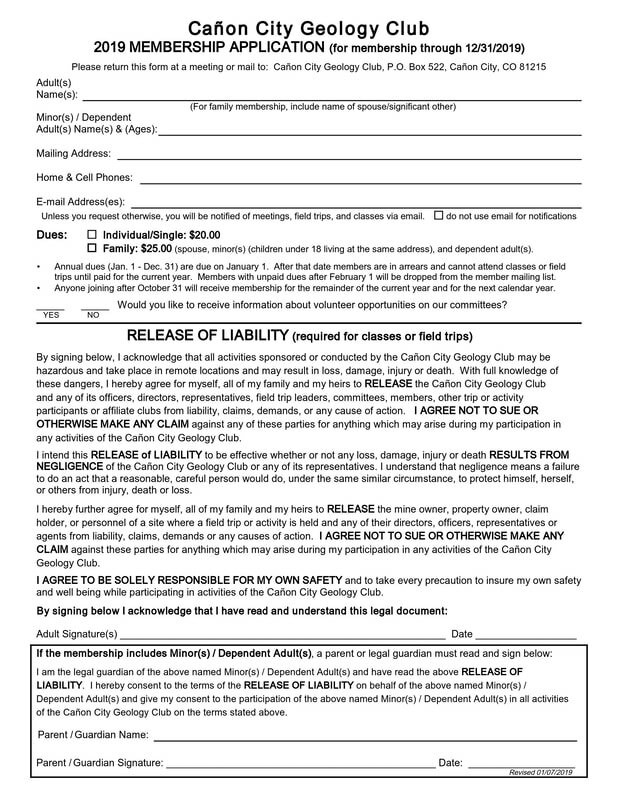 Click on the image to download the form.